I recently visited a friend Derry, in Northern Ireland, after attending the funeral of a Rotarian mentor, Ian Geddes, in Edinburgh. Ian and his wife Olive have been two of my greatest supporters over the years. They were the ones who encouraged me to become a peace fellow, and they also nominated me for the Champions of Peace award. It was a sad occasion with an unexpected perk: When I booked my flight, there was an option to return via Dublin. I took it as an opportunity to catch up with old friends. I rented a car for the drive from Dublin to Derry, where an old housemate from my time in Glasgow now lives. My GPS that came with the rental car had an Indian woman’s voice—a lovely and unexpected surprise! I decided to take a break from listening to American politics, and tuned my car radio to RTE and BBC Radio 4 to catch up on what’s happening in the UK instead. I listened to an excellent program on the impact of Brexit on the potato industry. I love these top quality half-hour programs; they’re inspiring because I’m always looking for ideas for ISC’s new podcast, which is currently in development. The last time I went to Derry, I took a bus from Belfast. Back then, being brown was still sort of a novelty in Ireland. Before that trip, when I was about 20 years old, I had studied for a brief time in Dublin. It was an intense, important time in my life because my mum had died just six months earlier. No surprise, then, that the friends I made when I came to Dublin are still some of my best friends to this day. Back then, Dublin seemed very different. I think most Irish folk would agree. It was certainly a much less multicultural city when I lived there, whereas now it feels much more European. I remember, as a student, struggling to find anything spicy to eat. Strapped for cash, we’d get the leftover black pudding slices at a shop for just 50p. I’d make them into a sandwich. Not very heathy, but quite tasty! Even then I tried to take my spices with me everywhere I went—a sort of traveling kitchen. I’d get the remaining vegetables of the day from the North Side Liffy Street market while walking back home from college. At the end of the day, you’d get the veggies in a bag for about one Irish pound. I’d cook for all my housemates, all eight of them. The friend I was visiting lives just outside of Derry, in Northern Ireland. It’s about a three-hour drive from Dublin. She and I had been housemates in Glasgow years ago. She had returned to Ireland to look after her dad, who was ill. (Both her parents have since passed.) Today she lives in a farmhouse within a three-mile radius of six of her siblings. She showed me the design and construction of a house she is building for her sister. My dad is an architect, so I’ve always been fascinated by that sort of thing. I arrived at the farmhouse and inhaled the sweet smell of fresh country air. My friend had been eagerly awaiting my arrival, partly because we hadn’t seen one another for 10 years, and partly because she was waiting on me for lunch! (I didn’t make it there until about 2:00 p.m.) We started with a baked potato (with Irish butter and tuna—delicious) in her local café in the village of Dungiven before we drove up to Derry. You really cannot beat a good baked potato. The last time I had been in Derry was 16 years before, and while I knew the river around the inner part of the city existed, I didn’t really know its function. It formed a barrier between two sections of the community, a dividing line between the (mostly) Catholic community in the inner city and the (mostly) Protestant community beyond the river, on the outskirts of the inner city. My friend (who was raised Catholic) suggested we start our walk on the side of the river that is Protestant and cross the Peace Bridge, a beautiful new pedestrian bridge that connect the two sides. An old army barracks had been converted in shops and restaurants, but it was still a residential area. I knew from my museum work (which had brought me to Derry 16 years before) that this was the place where, in 1972, the British army had killed 13 people, an event came to be known as Bloody Sunday. At the entrance to the Bogside neighborhood, from the wall, you can see a pub where notorious IRA men had their meetings. Back then, it would have been guarded with men in black balaclavas. If a British tank approached, women used garbage lids to clap on the ground. This signaled to anyone within listening distance so men could escape in underground tunnels that opened on the nearby hills. We walked the entire perimeter of what used to be a walled-in city. We caught up on life, and at the same time, looked out upon the city. 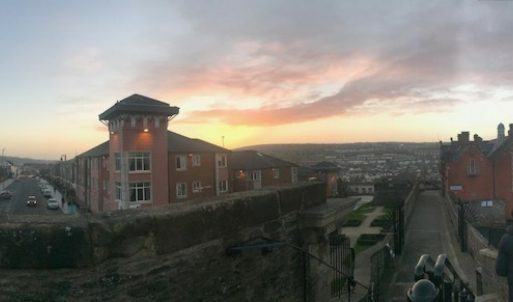 My friend told me about how much Derry has changed for her, and how different it feels from when she was a kid. Festivals and arts programs now bring people to the city from much further afield. Sometimes there are fireworks over the river. (There was a time when Northern Ireland banned fireworks for obvious reasons.) We saw the care and beauty that generations had taken to preserve history even as all this progress was made. The gardens and chapel had all been carefully looked after. My friend pointed out some of the old and new architectural features of the wall itself. At its highest point of the wall we stopped, and I explained why I’d gone to America to study and where I now work. I told her about the concept of the palimpsest, which I had learned about as a folklorist. It’s an old parchment scroll where ink would be rubbed out so it can be used again. Over time the remnants of past writing remained, even as the words changed. I explained how many of us folklorists might look at a place or a person, or even everyday objects and events in a similar way. When we look or listen carefully, we can see the past in all the stories we tell. In a city like Derry, you can literally see layers of history from every vantage. Terraced housing is juxtaposed with brick walls that date back to historic battles. Even from the city, it’s possible to spot an old cotton mill in the far distance. It’s marked with a neon sign, a perfect juxtaposition of old and new. It was getting dark and I was craving a Guinness, so made our way to an old Irish pub for a pint. We also sampled some of the local whiskeys, along with some cheese-and-onion flavored crisps. We ended that evening by the fire. My friend put some peat logs on the fire. They have a very distinct smell, and it always reminds me of the countryside. Elsewhere in Europe, the use of peat is regulated, but it’s considered part of Ireland’s cultural heritage. Smelling it reminded me of the smell of smoky Benton bacon (part of Tennessee’s cultural heritage). But it’s also a smell that I’ve found in many other places all over the world. In India, my grandma used to use it as natural fuel for her cooking fire. The next morning, we walked up a mountain, on a road that had been built. The area had been an outpost for American planes during World War II, but there’s nothing there that suggests that now (apart from my friend, who told me about it). The mountains in view were similar to the ones across Scotland lowlands. Similar, too, to the ones we have in Appalachia, where I live now. I have had personal connections to all these places, and I consider them all homes in different ways. This is easy once you consider the world as one home. On top of that wall, we imagined the old place we shared in Glasgow (to the east), and I told her about the house where I now live in Appalachia (to the southwest). I looked southeast, towards central England, where my dad now lives. Since he’s my only living parent, I consider wherever he is as my spiritual homebase. Sometimes it begins with a theme, and other times with a form. I had my existence. I was there. Me in place and the place in me. “Me in place and the place in me.” I like that. It’s food for thought.